At a new Penn Museum exhibit, visitors can see the journey that artifacts make from excavation to exhibition, along with the meticulous work done by Museum conservators to protect and preserve these priceless treasures. As part of the Museum’s historic Building Transformation project, parts of its Egypt galleries have been closed and many artifacts moved into storage to await reinstallation. With the monumental renovation unfolding, the “Ancient Egypt: From Discovery to Display” exhibition offers a unique visitor experience, with a behind-the-scenes view of how conservators work. The exhibition features two boat models; new Museum Overseer Matthew Storm, C’94, WG’00, and his daughter Cecilia explore one of them. Loren Eiseley Society member Missy McQuiston looks at a magnificent faience necklace on one side of the case, with Allison Weiss Brady, C’93, and her daughter on the other. Special receptions like this one invite LES members to engage with the Museum’s collections and staff. The exhibition showcases more than 200 objects—many on view for the very first time—in a completely new way. On February 27, more than 100 guests, including Museum Loren Eiseley Society members and Overseers, attended a special viewing of the exhibition with Williams Director Julian Siggers, and Jennifer Houser Wegner, the Associate Curator in the Egyptian Section. “We had a unique and exciting opportunity to keep sharing this remarkable collection with visitors throughout the renovation,” said Siggers during his opening remarks for the evening. The Egypt (Sphinx) Gallery closed last year, and the Egypt (Mummies) Gallery will also close in the future, before the targeted re-opening of the new Ancient Egypt and Nubia Galleries in 2022. The exhibit is divided into three sections, Wegner explained. The display section houses artifacts relating to three areas of Egyptian life: the divine, the royal, and the human; the “visible storage” area enables visitors to see objects that are being conserved and prepared for display, including the mummies of four adults and two children; and the Artifact Lab features conservators who answer questions for visitors while conducting meticulous preservation work. (From left) Diane Marimow, PAR’02, Alice Sachs, CW’69, PAR’96, PAR’00, and Herb Sachs, W’69, PAR’96, PAR’00, speak with Sachs Egyptian Collections Conservator Anna O’Neill at the Artifact Lab open window. 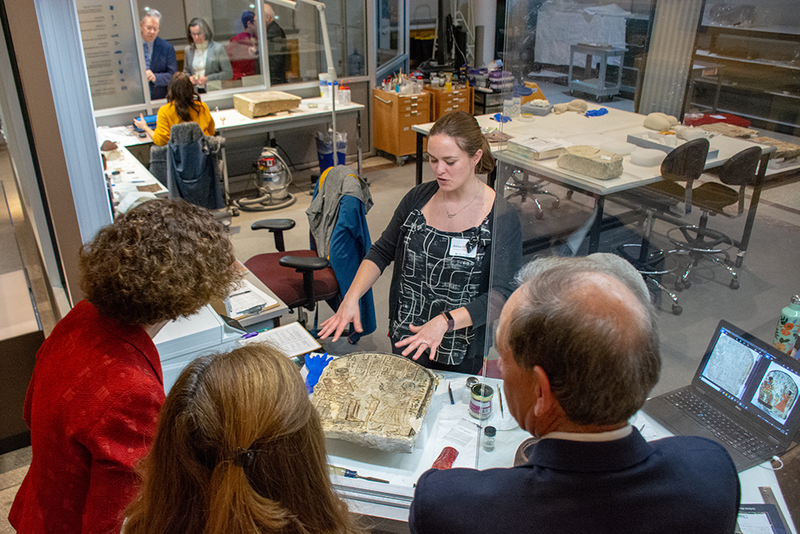 During the event, Anna O’Neill, the Sachs Egyptian Collections Conservator, was undoing a previous preservation treatment from the 1970s on the lid of a basket found in Sedment (a village south of Cairo) that dated back to the New Kingdom era. The methodical work required her to remove the substance previously used, restabilize the nearly 3,500-year-old artifact, then perform a new preservation technique. “It provides a whole new understanding of the essential and highly skilled work done by the conservators,” said Michael Heavener, a longtime member and a friend of the Museum, after seeing them at work in the Artifact Lab. For Anna Hadgis, CGS’70, G’85, PAR’99, a Museum docent who holds a graduate degree in archaeology from Penn, the exhibition reiterated the institution’s preeminence in the field. The exhibition is ongoing, and visitors can speak with conservators in the Artifact Lab during “Open Window” timeframes: Tuesdays through Fridays from 11–11:30 a.m. and 1:30–2 p.m., and Saturdays and Sundays from 12–12:30 p.m. and 3–3:30 p.m.